Iran announced Thursday it had launched a Simorgh rocket space-launch vehicle (SLV) from the Imam Khomeini National Space Station. Although Iranian state media claimed a successful launch, no independent sources have confirmed this assertion. The rocket launch comes amid escalatory rhetoric between Tehran and Washington surrounding the future of the 2015 nuclear deal known as the Joint Comprehensive Plan of Action (JCPOA). Last week, the State Department certified Iran’s compliance with the JCPOA, as required by Congress every 90 days. Nevertheless, President Trump recently told The Wall Street Journal he would be surprised if Iran were found to be in compliance during the next review period. With the president and deal opponents on Capitol Hill eager to see Iran declared noncompliant with its JCPOA obligations, it is critical to keep Thursday’s announcement in perspective. The attempted Simorgh test is not a violation of the JCPOA, which focuses solely on the issue of Iran’s nuclear program. Furthermore, although UN Security Council Resolution 2231, which paved the way for the implementation of the nuclear deal, does call upon Iran to refrain from pursuing certain ballistic missile activities, it does not explicitly prohibit activities such as the Simorgh rocket launch. Further, the Simorgh launch does not equate to Iran possessing an ICBM, let alone a weapon that could deliver a nuclear weapon to the United States. 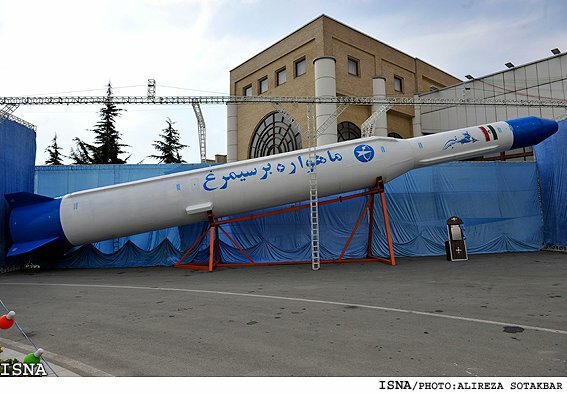 Although significantly larger than the launcher used for Iran’s Feb. 2, 2015, satellite launch using Safir rocket, the Simorgh is still too small to be a prototype of a military version that could carry a weapons payload 9,000+ kilometers to strike the continental United States. In addition, while a recent U.S. government intelligence report by the National Air and Space Intelligence Center (NASIC) noted that the Simorgh “could serve as a test bed for developing ICBM technologies,” multiple challenges preclude the Simorgh from being suited for this purpose. More development and testing would be required to protect a warhead during re-entry into the atmosphere and ensure accuracy in targeting. Conquering these challenges, according to the International Institute for Strategic Studies, “would require time, money and sustained effort.” It’s unclear whether such a commitment exists within Iran. Rather, Iran’s priority appears to be enhancing the quality and quantity of its existing missile arsenal. According to the NASIC report, the range of Iran’s Shahab 3 medium-range missile is estimated at 2,000 km – the same distance detailed in NASIC’s previous study. No Iranian missile listed in the report has a longer range. The Simorgh launch will certainly ratchet up tensions between Tehran and Washington even further. Yet any effort by opponents of the nuclear deal to paint Iran’s test as evidence of Iranian noncompliance would be overblown and can be added to their litany of false claims. The facts tell a different story: Iran is complying with its JCPOA obligations, and the world is a safer place as a result.